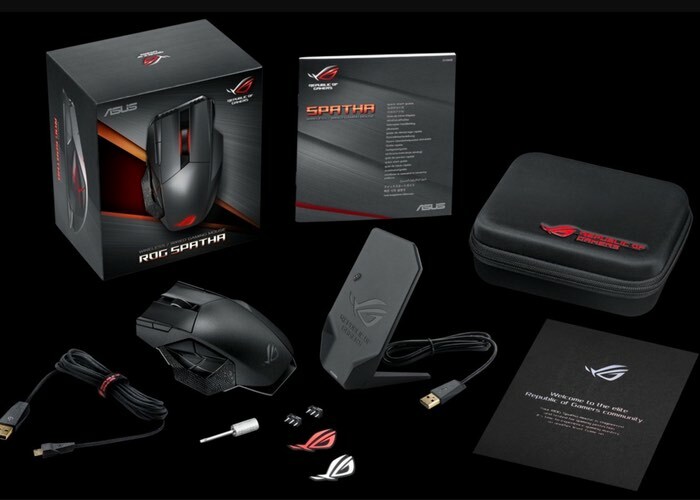 Asus has unveiled a new gaming mouse they have created in the form of the ROG Spatha MMO witch as the name suggests has been specifically designed for massively-multiplayer online (MMO) games and comes equipped with 12 programmable buttons. The Asus ROG Spatha MMO mouse is constructed from a magnesium alloy and includes the Asus exclusive easy swap switchable socket design together with programmable RGB LED effects. Asus Explains a little more about what you can expect from the new gaming mouse. Intuitive command and control : With a total of 12 programmable buttons, including six thumb buttons situated on the left side of the mouse body, ROG Spatha puts all commands at the user’s fingertips. The six buttons feature Alps switches for tactile feedback and are arranged to resemble the iconic ROG eye. ROG Spatha has a premium magnesium-alloy chassis and an easy-swap switch socket design for quick customization. The main left and right mouse buttons are independent of the mouse body and feature OMRON switches with a 20-million-click lifespan for increased durability, responsiveness, and tactile feedback. ROG Spatha has a sensitivity of 8200 DPI; it has a DPI clutch that lets users switch between two sensitivity levels while in the middle of a game. Dual modes for additional flexibility : Whether used in wired or wireless mode, ROG Spatha provides precise and instantaneous cursor response. In wireless mode, ROG Spatha uses a high-speed wireless connection for high data throughput and low latency. ROG Spatha gives a polling rate of up to 2000 Hz in wired mode. A special raised connector design prevents the cable from dragging on the desk to ensure a smooth glide across any surface. ROG Spatha can be charged in wired mode, or when placed in its charging dock. It comes bundled with a braided 2 m cable and a 1 m rubber cable. Customizable LED effects and ROG Armoury : ROG Spatha has an aggressive angular design with independently customizable RGB LED effects on the scroll wheel, side buttons, and ROG logo. It offers six different presets – Static, Breathing, Color Cycling, Trigger, Random, and Battery mode. ROG Spatha has built-in flash memory to save five different user profiles. The intuitive ROG Armoury dashboard lets users customize profiles, LED effects settings, program macros, and more. Unfortunately no information on pricing or worldwide availability has been released as yet by Asus, but as soon as information comes to light we will keep you updated as always.